Etrian Odyssey V isn’t the only new 3DS game Atlus is localizing. 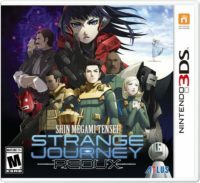 Shin Megami Tensei: Strange Journey Redux will be released in North America early next year, and likely Europe as well. Just like the way in which Etrian Odyssey V’s localization was discovered, the news about Shin Megami Tensei: Strange Journey Redux comes from an Atlus test page. Expect an official announcement soon.